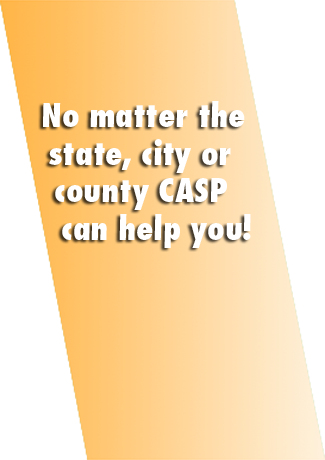 CASP supervises misdemeanor probation and traffic probation for courts throughout Missouri and can take assignments from other states as needed. 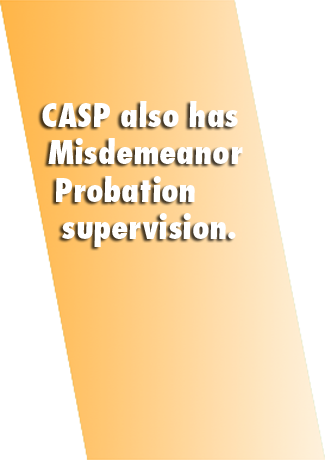 CASP monitors the probationers for the term of their assigned probation and reports to the Court their compliance or non-compliance of the Court’s conditions of probation. Fee is based upon the term of probation. Through this program, the client will meet with a probation officer as assigned due to the specifications of their case. CASP will monitor all conditions set forth by the court including payment of restitution, attendance and participation in drug and alcohol programs, submitting to random drug tests, and other classes the court has assigned. Failure to comply with the terms of probation or the direction of the probation officer will result in further Court action up to and including jail time. Level 1: Supervised probation $30 per month. Level 2: Supervised probation until all conditions completed, then changes to unsupervised probation, if no violations. $30 per month. Level 3: Driving records and criminal history will be checked regularly. Defendant reports 1 time to CASP for registration within 48 hours. $10 per month. LAWS: Defendant shall obey all federal and state laws, municipal and county ordinances. 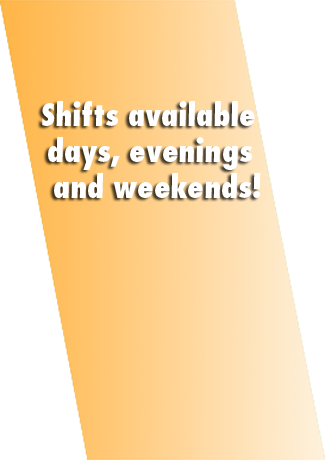 Defendant shall report all arrests and law enforcement contacts to the CASP Probation Supervisor within 48 Hours. TRAVEL: Defendant shall obtain advance permission from the CASP Probation Supervisor before leaving the state or defendant's place of residency for more than one week. RESIDENCY: Defendant shall notify the CASP Probation Supervisor of any residency and/or telephone number change within 48 Hours. EMPLOYMENT: Defendant shall maintain employment unless engaged in a specific program approved by the CASP Probation Supervisor. Defendant will notify CASP Probation Supervisor of any employment changes within 48 Hours. ASSOCIATION: Defendant shall not associate with any person who has been convicted of or placed on probation for a felony or misdemeanor. It shall be Defendant's responsibility to know with whom he/she is associating. DRUGS: Defendant shall not possess or use any controlled substance except as prescribed for him or her by a licensed medical practitioner. WEAPONS: Defendant shall follow all directives of the CASP Probation Supervisor regarding possessing or access to weapons. A) Defendant shall report as directed to the CASP Supervision Unit within 48 hours of this order being entered. B) Defendant shall abide by all directives given by the CASP Supervision Unit. 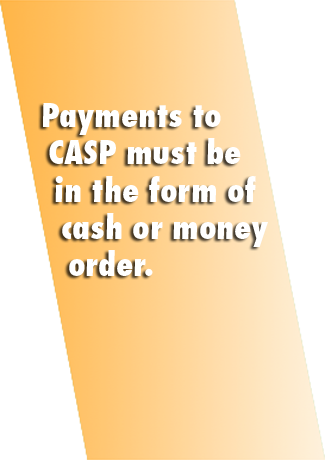 C) FEES: Defendant shall pay the fees charged by the CASP Supervision Unit for its monitoring of the probation term. Successful Completion of ______________ by __________and participation in such aftercare and/or counseling as may be recommended. 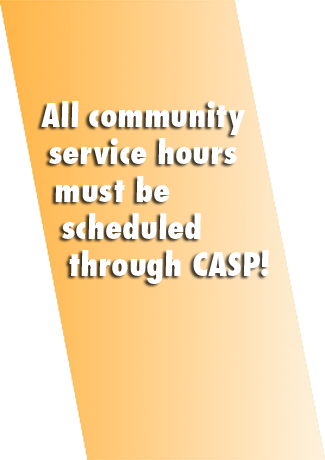 Perform __________ hours of community service by __________ supervised by CASP. No drinking alcoholic beverages. Not to be on the premises of a business whose primary business is the sale of alcohol. Submit to random urinalysis, or breath or blood tests upon the request of the CASP Supervision Unit and pay the fee for such test. 7:30 a.m. — 4:30 p.m.